New York Yankee pitcher Catfish Hunter’s assessment of what it was like to pitch to Rod Carew may have been the opinion of many other pitchers from around the American League. Minnesota’s Rod Carew was hitting at a torrid pace in 1977. From June 26 through July 10, the left-handed first baseman maintained an average above .400. He ended the season hitting .388. His hitting ability gripped America as he appeared on the covers of Sports Illustrated and Time in the week of July 18, 1977. On October 1, 1945, Eric Carew and is expectant wife, Olga, were traveling by train from their home in Gatun, Panama, to Gorgas Hospital in Ancon. They were seated in the rear coach—reserved for colored folks—as they embarked on the 40-mile trip. Olga began to feel uneasy as she went into labor. A nurse by the name of Margaret Allen rushed to Olga’s aide to deliver the baby. When the conductor realized what was happening, he hurried to the front of the train in search of a doctor. Dr. Rodney Cline rushed to Olga Carew to complete the delivery. In honor of Dr. Cline, Eric and Olga named the child Rodney Cline Carew. For her efforts, Margaret Allen was asked to be Rod’s godmother. Known to his family as Cline, Rod Carew had four siblings, three sisters and one brother. Eric Carew worked as a sign painter along the Panama Canal. But he was an abusive father who physically disciplined his two sons (Rod and brother Dickie) on a regular basis. He also drank quite regularly, often arriving home in a foul mood. The Carew children lived in fear of their father. Carew’s relationship with his father was strained to say the least; it was his mother who offered the children guidance and support. Rod also received direction from Joseph French, the gym teacher at his grade school. French was Olga’s brother-in-law, Rod’s uncle. He got Rod started in Little League in Gamboa. Even at a young age, Carew showed that he had the potential to be an excellent batsman. Rod attended Paraiso High School for two years. He was an exceptional student and a fine athlete. But Olga wanted to leave Panama for two reasons: first, to provide a better life for her children; second, to get the children away from Eric. Her target destination was New York City. Olga received assistance from Margaret Allen, who helped Olga get the paperwork in order. Olga’s brother Clyde Scott provided the financial aid to get the paperwork processed. After she got settled in New York, Olga requested that two of her children join her. Since Allen was Rod’s godmother she requested Rod; Dickie won a family lottery and joined Rod on his journey to the U.S. in 1962. Rod and Dickie lived with their mother in the Washington Heights area in upper Manhattan. Rod enrolled at George Washington High School, the school attended by Henry Kissinger and Manny Ramirez. Rod got a job as a stock clerk in a grocery store. His days were routine: school and work; he did not play baseball in high school so he could hit the books. One of Rod’s biggest hurdles was mastering English; learning a new language and keeping his studies up were of the utmost importance to him. A tryout was arranged when the Twins came to town to play New York at Yankee Stadium. Carew sprayed hits all over the field, impressing the Twins’ manager Sam Mele. After Rod graduated from high school in June 1964, he signed a contract with the Twins that included a $5,000 bonus and $400 a month when he reported to Cocoa, Florida, for Rookie League. After Carew completed the season down in Florida, he joined the Marine Corps to fulfill his military obligation. Although he was not a citizen of the United States, Carew was a permanent resident. He later would spend an additional five and a half years in the reserves. Rod spent two years in the Minnesota minor league system. In 1965 he was assigned to Class A Orlando of the Florida State League. Rod batted .303 and stole 52 bases. The following year Carew moved on to Class A Wilson (NC) of the Carolina League. Carew manned second base for both seasons. Rod made his major league debut on April 11, 1967 against the Orioles at Baltimore’s Memorial Stadium. He singled in his first at-bat against Dave McNally in the second inning and went 2-for-4 on the day. For the season the rookie hit .292 and played a credible second base. He was named the American League’s starting second baseman for the All-Star Game on July 11 at Anaheim. (Obviously Griffith knew what he was talking about.) It was the first of 18 mid-summer classics for Rod. He was also named Rookie of the Year by both the Baseball Writers Association of America and the Sporting News. Unfortunately the Twins got off to a slow start in 1967 and Mele was let go after posting a 25-25 record. He was replaced by Cal Ermer. Under Ermer, the Twins went 66-46. On September 26 they held a one game lead with three games to play. But they dropped their last three games, including the last two to the Red Sox at Fenway Park. Boston squeaked in to grab the pennant. The 1967 season saw the last true tight pennant race in the major leagues. In 1968 the Tigers breezed through the American League. In 1969, both leagues expanded by two more teams and each went to a two-division format. This created a round of playoffs before the World Series. No longer was the team with the best regular-season record guaranteed a spot in the Fall Classic. The Twins won back-to-back American League West titles in 1969 and 1970. Both years they held off Oakland by nine games. And in both seasons they were swept by Baltimore in the American League Championship Series. Two of the defeats in 1969 were by a single run. That year Minnesota was managed by Billy Martin, who had served on the staffs of both Mele and Ermer. For Rod Carew, 1969 was the first of seven seasons when he led the league in hitting. He sat atop the league with a .332 batting average. On May 20, 1970, at Kansas City, Carew became the first player in Minnesota history to hit for the cycle.9 Then on June 22—when he was hitting .374—severe injury came his way. In the fourth inning in a ballgame against Milwaukee at County Stadium, Brewers first baseman Mike Hegan upended Carew in an attempt to break up a double play. Carew felt that he was out of harm’s way, but Hegan slid way outside the baseline. Carew’s left leg snapped like kindling. Surgery was required to remove cartilage and repair torn ligaments. But it was not Rod’s way to harbor bad feelings. He returned later in the season, serving as a pinch-hitter for a few games in September. Carew had been courting Marilynn Levy for over two years, and on October 24, 1970, they were married in a private ceremony. Both Rod and Marilynn had hurdles to climb; not only was theirs an interracial bonding, but also Rod was Episcopalian and Marilynn was Jewish. But they overcame any obstacles that came their way, including death threats that Rod more or less just blew off. “After I met her mom and dad and got to know them,” said Carew, “they told me the only thing they wanted me to do was to take care of Marilynn and make her happy.”10 Rod and Marilynn had three daughters, Charryse, Stephanie, and Michelle. Gene Mauch took the helm of the Twin in 1976 and moved Carew to first base. Although Carew had started 14 games there the previous September, this time the move was permanent. The shift was made ostensibly to extend Rod’s career, first base being the least taxing position on a player’s body. The Twins ended their season at Kansas City. George Brett, Hal McRae, and Carew were all vying for the batting title. But on that day, Brett topped them all, going 3-for-4 while Carew and McCrae both turned in 2-for-4 performances. Brett finished with a .333 average, McRae at .332 and Carew at .331. In spite of a certain amount of success, Minnesota was in the middle of the pack in the A.L. West Division. The losing began to take a toll on Carew, although his play on the diamond still sparkled. Like all players, no matter what their accomplishments were on the field or how large a contract might be, their ultimate goal was to win a world championship. 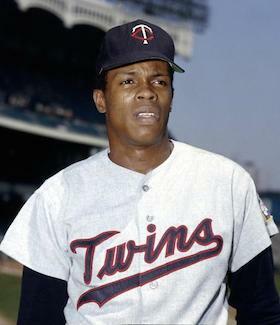 Carew had signed a three-year pact before the 1977 season with the Twins, so he was obliged to play out his contract and then test the waters of free agency. Carew had watched as former teammates Larry Hisle and Lyman Bostock signed lucrative deals with Milwaukee and California respectively. Rod’s relationship with Twins’ owner Calvin Griffith had turned downward, as their differences were played out in the press. The trade was expected to have an effect on ticket sales, and it did. The Angels ticket department took in an estimated $45,850 for season ticket packages, and further projected that an additional $30,000 would have been raked in if single-game tickets also went on sale. Supporters of the Halos, both old and new, were not disappointed. The Angels had built a formidable team, mostly through free agency. Joe Rudi, Rick Miller, Don Baylor, Brian Downing and Bobby Grich had all joined the Angels by that route. In 1979 California broke the three-year stranglehold that Kansas City held on the A.L. West Division to take the crown. Unfortunately for Carew and the Angels, they were matched up against Baltimore in the LCS. The Orioles had been Minnesota’s nemesis a decade earlier, and times did not change much as they defeated California three games to one. For Carew, the address change to Southern California did not diminish his skill at the plate. For five straight years (1979-1983) he batted over .300. Unlike his years with the Twins, Carew had more protection in the Angels’ lineup. The Angels returned to the postseason in 1982, but were eliminated again in the LCS. This time Milwaukee ousted California in five games. On August 4, 1985, Carew singled off Minnesota’s Frank Viola in the third inning to notch his 3,000th career hit. “It’s something I thought I would never accomplish,” said Carew, “but I’ve been around for 19 years, and if you stay around long enough, good things happen to you.”13 Carew was the 16th player in major league history to reach the 3,000 hit plateau. It turned out to be the last hurrah for Rod Carew. In 1986, major league rosters were reduced to 24 players. Suddenly, and to many surprisingly, he was on the outside looking in. When no teams offered him a job, even at a reduced salary, Rod Carew retired from the major leagues. His career batting average was .328. He totaled 3,053 hits including 445 doubles, 112 triples, 1,424 runs and 353 stolen bases. He hit 92 home runs and drove in 1,015 runs. Rod Carew was inducted in the National Baseball Hall of Fame in 1991. He was the 27th player in history to be elected in his first year of eligibility. “The Hall of Fame’s very sacred to me,” said Carew. “I remember Bobby Doerr looked at me and said ‘Welcome to one of the greatest fraternities in the world.’ There are such exceptional athletes in there.”14 Carew was the first player from Panama to be enshrined. Today, Carew waits for his fellow countryman Mariano Rivera to join him. Rod will no doubt share the same sentiment with Rivera: Welcome to one of the greatest fraternities in the world. Unfortunately, Rod Carew’s darkest days were ahead of him. His 18-year old daughter Michelle was stricken with leukemia in 1995. It was imperative that a bone marrow donor be found in order to give her a chance to beat the disease. Her two older sisters were a match for each other, but not for Michelle. Carew, a private person who had often been cold and indifferent to the press, found himself in the position of needing to use the press to find a donor. “At first, I had to think about it. I didn’t want to make a spectacle out of my daughter’s health. We talked about it as a family. Michelle said if it would help out other kids, then we should do it. And I said ‘OK.’ She knew how tough it was for me because of my past experiences with the press,”16 said Carew. Sadly, finding a donor for Michelle was not to be. But through Carew’s efforts, the registry rolls for bone marrow transplant grew by 500,000 in the first year. It is a cause that Carew fights for to this day. Unfortunately, what often happens when a child passes away is that there is collateral damage. Rod and Marilynn divorced after 26 years of marriage. In 1979, Carew and Ira Berkow wrote his autobiography, Carew. It was a very candid and open look into the ballplayer’s life up to that point in his career. As of 2015, Carew lives with his second wife, the former Rhonda Jones, in California. He will often spend time watching youngsters playing the game he loves, offering tips and suggestions on how to play the game the right way. The Twins hired him as a special assistant in 2013. Before the All Star Game at Target Field in 2014, a portion of Second Avenue N. between 6th and 7th streets was named in his honor. Carew’s number 29 has been retired by both the Minnesota Twins and the California Angels. Indeed. Rod, you have given all of us more. Much, much more. The author would like to thank SABR member Stew Thornley with his help on this bio. 4 Stew Thornley phone interview with Herb Stein, August 7, 2004.